When we think of an amusement park, we conjure up visions of roller coasters that roar by, of carnival games along the fairway, and of near limitless amounts of cotton candy. These things are all classic parts of the amusement park experience. But early parks had one element that parks today often don’t have, organ music! Yes, early amusement parks had the melodious sounds of an organ to provide the background music for a fun day at the fairway. Read on to learn about the band organ, and then browse our selection of fine digital organs from Viscount Organs. Early amusement parks lacked many of the mechanical attractions and rides that they have now. But at the turn of the 20th century, that began to change. Advances in mechanical engineering, electrical work, and workers rights all blended together to create the need for brightly lit and exciting spaces for people to spend their free time. While exciting innovations like early cinema, wooden roller coasters, and shows no doubt captivated the senses of visitors, amusement park owners wanted their spaces to be truly unique in every way. Beginning in the 1880s, many organ companies began making fairground, or band organs. These organs were designed with several notable features, and with a distinct purpose in mind. In many cases, they were electric powered, which operated the bellows needed to provide air to the organ and to move the various decorations. These band organs were essentially giant player pianos. Like player pianos, the band organ was played mechanically by a rotating barrel with the music pinned on it. As the barrel rotated, it would cue parts of the organ to play. It was not uncommon for band organs to have elements of a pipe organ, as well as trumpets, trombones, drums, and glockenspiels, all conducted by a tiny mechanical bandmaster. 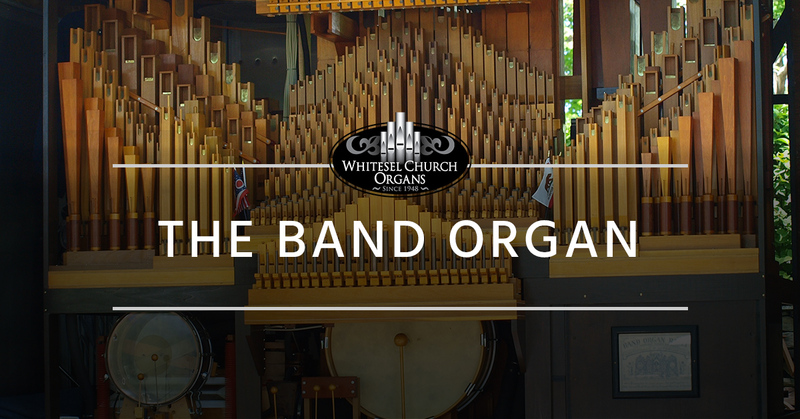 The band organ was designed with two major concepts in mind: it should be self-playing, or capable of being played by a novice organist, and it should be able to play very, very loudly. Park owners recognized that their joyous spaces were noisy, with screams of delight, the sounds of attractions, and the general babbling of an excited crowd. The sound of instruments would be lost in this cacophony, so the band organ was incredibly loud to cut across all of these other sounds. Some band organs were also designed to be portable. Parades were a common part of many amusement park attractions. It wasn’t uncommon to see a band organ towed behind a fleet of horses, merrily piping away as performers and animals marched past a crowd of people. Today, it is rare to find a band organ at an amusement park, but there is a strong preservation movement to maintain these distinct pipe organs. Some create new instruments to add to the old band organs, while others create new music barrels so the organs can play modern arrangements. If you’re looking to capture that same sense of musical fun that the band organs of the early 20th century did, why not play one of our fantastic digital organs from Viscount Organs? They have a beautiful array of sounds, are of spectacular quality, and can be attached to your existing pipe organs. Find out more on our Viscount Organs page, and call Whitesel Church Organs now!